Betamere Self-cateringA delightful ground floor apartment with a quiet air of luxury very close to Lake Windermere at Waterhead - an ideal place for a relaxing holiday in the very heart of the Lake District. There are views of the lake from the main rooms and also from its own south facing garden terrace. Indeed you could well become so lazy here that you may not wish to stir from this pretty setting! There are five acres of shared grounds around the property with a host of trees and shrubs and you can frequently see deer and rabbits and a wide variety of birds. Accommodation: Betamere has its own front door leading into a hallway with hanging space for coats etc.. The large open plan sitting/dining room (flat screen TV, video, electric fire,wi-fi) has lake views from its large windows. Good quality fitted kitchen area is all in limed oak with built-in oven and hob. Double bedroom, also with large windows and lake views, has a useful en-suite toilet and basin. Main bathroom has bath, shower, basin and wc. The property is furnished in co-ordinated pastel colours with a great deal of attention to detail and many personal touches. Fitted carpets throughout. Storage heaters. 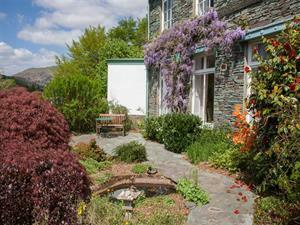 This beautifully presented property would be ideal for a holiday at any time of the year. It is a very popular holiday venue with many regular clients. Sorry no pets * non-smoking * duvet/bed made up for arrival * storage heaters and off-peak water heating * all fuel included * fridge/freezer * dishwasher * microwave * washer/dryer * sorry no children or babies * towels available - please order * Lake Windermere 2 minutes walk * shops and Post Office in Ambleside three quarters of a mile. A delightful ground floor apartment with a quiet air of luxury very close to Lake Windermere at Waterhead - an ideal place for a relaxing holiday in the very heart of the Lake District. Ground floor apartment. Children welcome from any age. 10% OFF all remaining weeks in April including Easter Breaks....BOOK NOW!! Website price reflects discount. Betamere offers weekly bookings starting on Saturday.